Ramen is something Tyler and I have recently gotten very into. We have a place by our house, Men Oh Tokushima Ramen, that has become our go to for cold, foggy evenings. Slurping down noodles and salty pork broth will take the chill off any day. Ramen is definitely one of the current popular food choices in the city, and many have their favorite spot, whose authenticity they will defend to no end. Although I admire the time and effort it takes to make the perfect pork bone broth for a great bowl of ramen, I'm not quite there yet. I have, however found a way to elevate my ramen packet to a delicious weeknight meal, sans MSG/sodium/chemical packet. The key to taking a meal from a 50¢ ramen packet to a restaurant-quality dish, is to take care with each ingredient. Let's start with the broth. Instead of water, use chicken or vegetable broth, but don't stop there. Flavor it with kombu to bring in the taste of the ocean and miso to impart savory umami flavors. Instead of freeze dried corn, carrots, and peas, use mix-ins that you enjoy eating with noodles or soups. I chose bok choy, mushrooms, bacon, peas, and green onions. If you don't like any of those, substitute for something you'd enjoy! I highly recommend the poached egg, though, no matter what your other add-ins are. Prep your vegetables. 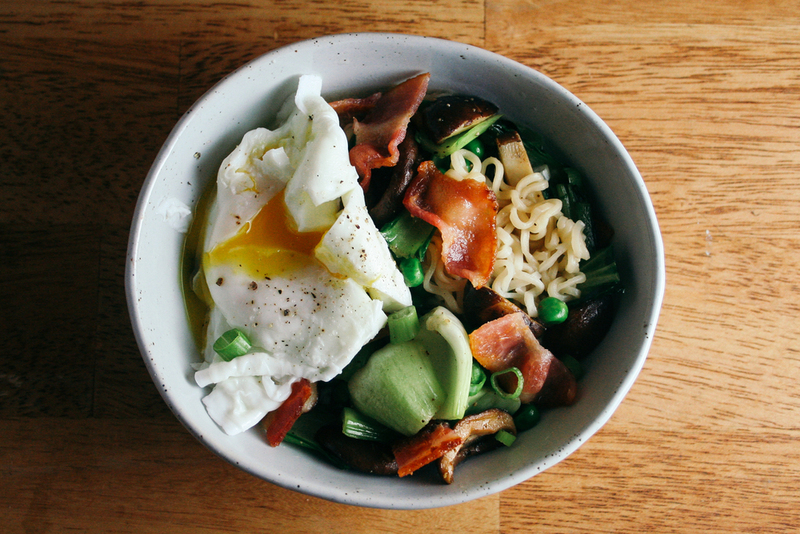 Chop bacon into bit sized pieces, repeat with the bok choy (discard any wilted tips of the darker green leaves), slice your mushrooms, and chop your green onions. Add broth to a medium pot and place over medium-high heat. Stir in garlic and onion powders. Place kombu in broth. Once broth starts to boil, lower the heat so the broth can simmer. With a small bowl or spouted measuring cup, take out about 1/2 - 1 cup of the broth. Add miso paste to the separated broth, and stir until incorporated. Remove and discard kombu, then add broth back to the pot. This trick helps the miso better dissolve, so you don't have clumps of it floating in your broth. While still simmering, place ramen noodles in broth, and cover while they cook. You may have to push them around with a fork to make sure broth is touching all the noodles, and so they cook evenly. Place a pan over medium heat with butter or olive oil, then add mushrooms. Cook, stirring occasionally, until softened, about 3-5 minutes. Add bok choy, bacon, and peas, and cook, still stirring occasionally, until all ingredients are warmed throughout, and the mushrooms and bok choy have softened to desired consistency. While cooking the mix-ins above, poach your eggs. Scoop noodles into a bowl, top with mix-ins and green onions, and pour broth over it all. Place poached egg on top, and break the egg yolk when you're ready to eat.